A social experiment was conceived. Its goal was to breed the best, the brightest, the most malleable and most loyal soldiers to ever serve. To this end, the Romulan Empire used its own children, blinded by the belief that anything that would bring glory to the praetor was justified. And when the winds of politics changed, these children were abandoned, left to die on a world so horrifying that it was dubbed—by those who dared to cling to life—Hellguard. One wild child, Saavik, was rescued by Spock. He took the half-Vulcan, half-Romulan child home to his parents, knowing that if anyone could reach and rescue Saavik, it was them. Now a Starfleet officer, Saavik has striven to honor her mentor and her Vulcan heritage. But recent events have shaken her. Left behind on Vulcan while the rest of the Enterprise crew goes to face court-martial for stealing and destroying their ship, the young science officer is adrift when two men from her past confront her. Tolek, another Hellguard survivor, tells Saavik that the survivors are being killed one-by-one and only they can discover who and why. The other, a Romulan who claims to be her father, swears it is the Vulcans who are eliminating the Hellguard survivors because they are an embarrassment to all of Vulcan, but that she has the power to stop it, by bringing down the Vulcan ambassador, Sarek. Not knowing where to turn, not knowing whom to trust, Saavik must find her own answers, and discover who she truly is. Prior to the terror-filled times of the Long War—the seemingly endless struggle against the Undine, a paranoid, shape-shifting race once known only as Species 8472—enemy sleeper agents quietly penetrated every echelon of Federation society, as well as other starfaring civilizations throughout the Alpha and Beta quadrants. The ensuing conflict shook humanity to its very core, often placing its highest ideals against a pure survival instinct. All too frequently, the Undine War demanded the harshest of sacrifices and exacted the steepest of personal costs from the countless millions whose lives the great interdimensional clash forever altered. Drawn from his exhaustive research and interviews, The Needs of the Many delivers a glimpse of Betar Prize–winning author Jake Sisko’s comprehensive "living history" of this tumultuous era. 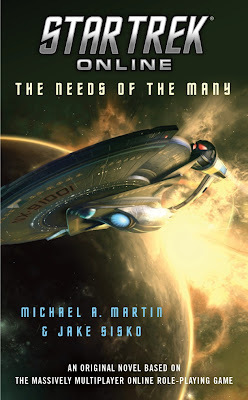 With collaborator Michael A. Martin, Sisko illuminates an often-poorly-understood time, an age marked indelibly by both fear and courage—not to mention the willingness of multitudes of unsung heroes who became the living embodiment of the ancient Vulcan philosopher Surak’s famous axiom, "The needs of the many outweigh the needs of the few." Discovered by DarkHorizon on the TrekBBS.